Holiday potluck dinners are a favorite tradition of mine because I love to see what everyone brings to the table. From Oreo balls to sausage cheese balls and everything in between… I love it all! The only problem is trying to fit it all on the plate! Chicken Alfredo Pizza Bites Wreath is an easy holiday appetizer idea that will impress your guests with that wow factor. My earliest memories of the holidays are going to potluck dinners and being surrounded by family. Grandpa would always made a ham for Christmas and everyone else would always brings the sides. My grandpa passed away many years ago, but we still love get together for the holidays. This year I am bringing this beautiful pizza wreath to our family potluck Christmas dinner! When I thought up this recipe for a Chicken Alfredo Pizza Bites Wreath, I knew that it would be a big hit at our holiday parties! It turned out to be delicious and is very easy to make. It looks like something that would take all day to prepare, but it comes together in under 45 minutes! I started out this recipe with easy ingredients like Ragú® Sauces and refrigerated biscuits. Ragú® sauces have a delicious taste the whole family will love! The biscuit dough is wrapped around a mixture of chicken, cheese and alfredo sauce. It’s a classic flavor combo that everyone in my family enjoys. This Easy Christmas Wreath Appetizer has a great pizzeria taste! No one will ever believe you used refrigerator biscuits to make them! I love biting into the chicken with the marinara sauce and mozzarella cheese in the middle. To make the wreath look a little more like a holiday wreath I used spinach leaves, rosemary sprigs (often available at grocers this time of year) and bell peppers. 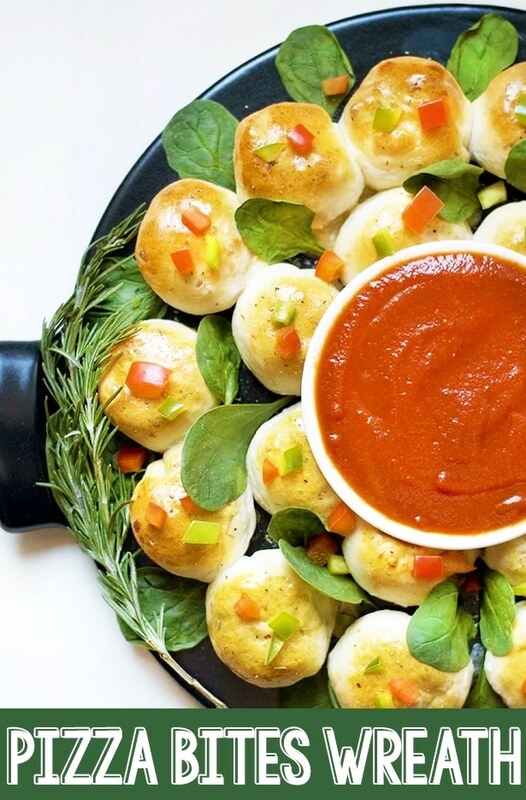 Leave a little space in the middle of the wreath for the marinara sauce to make it easy for everyone to dip the pizza bites into. Red marinara looks festive with the green spinach and rosemary sprigs. 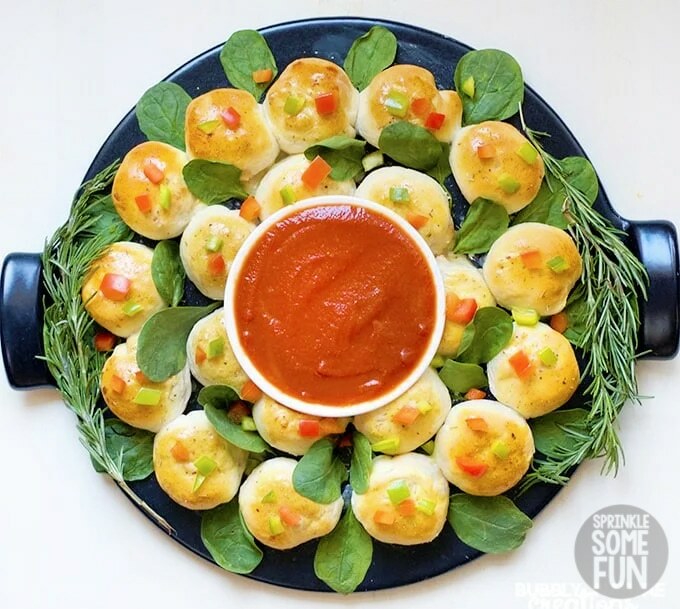 The great thing about this pizza bites wreath is that you can have everyone grab a bite to put on their plate or serve it family style with everyone sitting at the table. 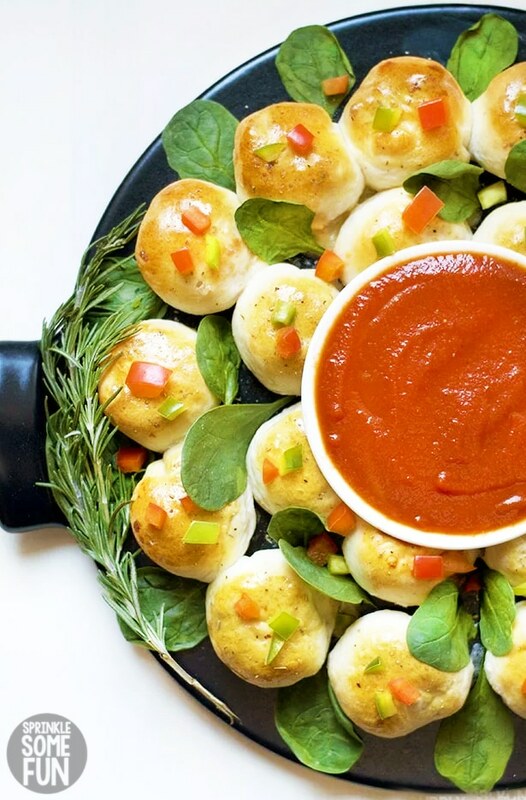 Another great thing about the pizza bites wreath is that you can change up the recipe depending on what style of pizza you like. Just switch out the chicken Alfredo filling for your favorite pizza toppings. Pepperoni Pizza Bites. Use a mix of marinara, mozzarella and pepperonis. Supreme Pizza Bites. Use olives, marinara, mozzarella, cooked sausage, onions and peppers. Hawaiian Pizza Bites. Use pineapple tidbits (drained) with mozzarella and Canadian bacon. 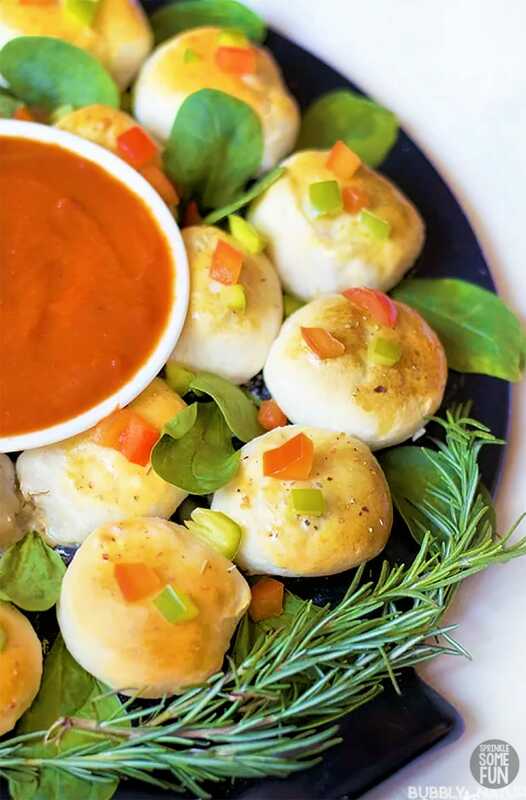 Greek Pizza Bites. Use olives, peppers, feta, Greek meat and marinara sauce. Five Cheese. Use a blend of five Italian cheeses with Italian herbs and marinara sauce. Each wreath will make around 16-20 pizza bites depending on how many biscuits are in the refrigerated dough you buy. I like to make around 20 to fill up our large pizza pan, but you can adjust to the size you want. Additionally, use any leftover filling with pasta and serve it that way for a delicious chicken Alfredo. This Chicken Alfredo Pizza Bites Wreath is sure to be a Holiday hit at any potluck or holiday party! I can’t wait to try this recipe with all the other filling ideas. We could have this every week during the holidays and never tire of it. 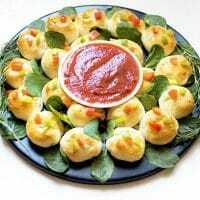 Have you tried making pizza bites with biscuit dough yet? Let me know if you do and share it with me on social media. 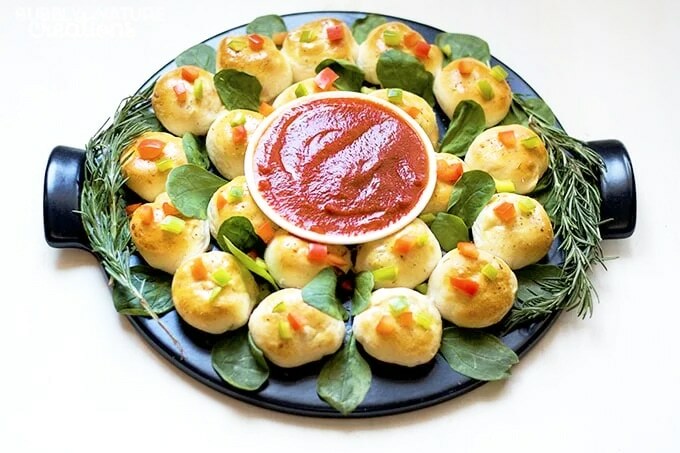 If you love this Pizza Bites Wreath then please give us a five star review below! 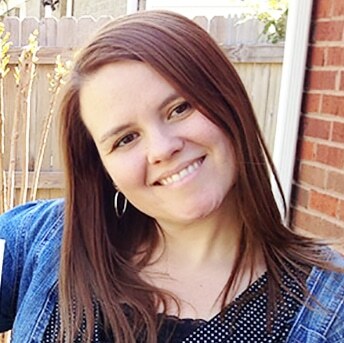 Be sure to follow me on social media so you never miss a post! Next, I made the filling with a mixture of mozzarella cheese, chicken, and Ragú® Cheese Creations Classic Alfredo. Then I wrapped a spoonful of the cooked mixture inside the biscuit dough. Once all the Chicken Alfredo bites were wrapped, I placed them together in two circles on a pizza stone and baked them at 350° for around 15 minutes. Preheat oven to 350°. Make the filling first in a medium pot on medium heat with mozzarella cheese, chicken, and Ragú® Cheese Creations Classic Alfredo and stir until everything melts together (about 5 minutes). Then wrap a spoonful of the cooked mixture inside one individual biscuit dough piece into a ball. 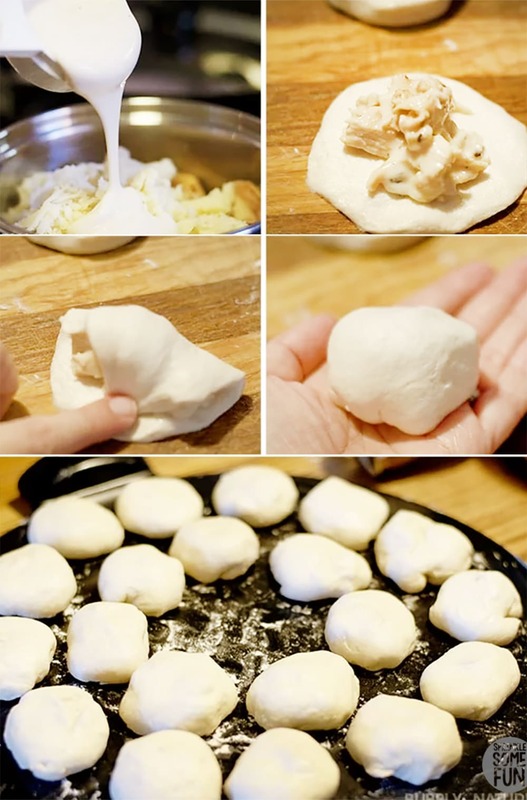 Arrange pizza bite dough balls onto your pizza pan or stone into 2 circles. The balls should not touch, but be around 1 finger width apart. Brush each ball with a little of the egg and sprinkle with italian seasoning. Bake at 350° for around 10-15 minutes or until the pizza bites are golden brown. When the pizza bites cool a little then decorate with the garnishes. 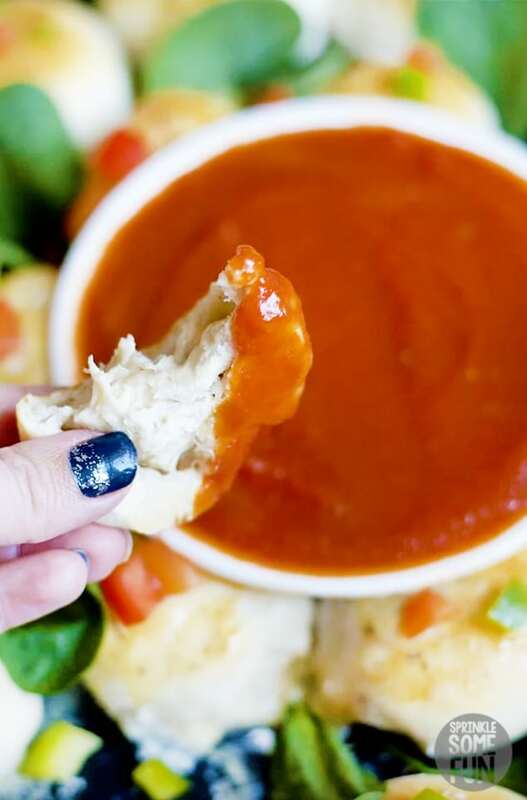 Add a bowl of the Ragú® Old World Style® Sauce in the middle for dipping. Enjoy! Previous Post: « Easy Holiday Appetizers and Party Tips! Yum! My whole family of picky eaters would eat this! Pinning!! And U saw this on Instagram last week and have been patiently waiting! Oh YUM!! You have combined so many of my favorite things and I love the cute wreath presentation!! Delicious and beautiful presentation? I’m so going to make this! It is delicious for me and chicken alfredo pizza is my best pizza. This recipe will help me to prepare it myself.